Hello! Earlier in November, I spotted this coat on the racks of Forever 21 and was immediately drawn to it. It's over-the-top, magnificently luxe and makes quite the statement. The alternating black and white colors of the coat also contribute to a sort of Cruella De Vil feel. And we all know that Cruella De Vil is the queen of fur coats. 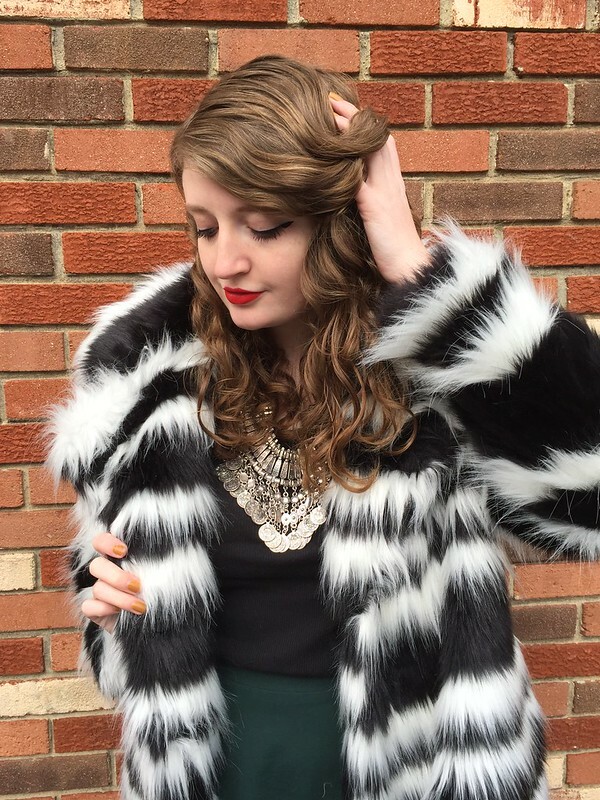 While I don't approve of real fur like Cruella De Vil, I do sort of feel like the queen of faux fur. So when I saw that this coat cost roughly $90 in November, my heart was practically crying when I realized that I wouldn't be able to add this beauty to my wardrobe. Now, imagine my delight when I popped by Forever 21 a couple weeks ago and this coat had gone on sale for 50% off. Of course, I had to have it! And I'm so happy to have added it to my wardrobe. I've already worn it a couple times and am loving it. For this look, I layered the coat over a simple, black long-sleeve top and deep green circle skirt. The coat makes such a statement by itself that it doesn't need to be styled with a statement dress or a lot of accessories or prints. It's the perfect coat to make a simple outfit go from blah to wow in just seconds. 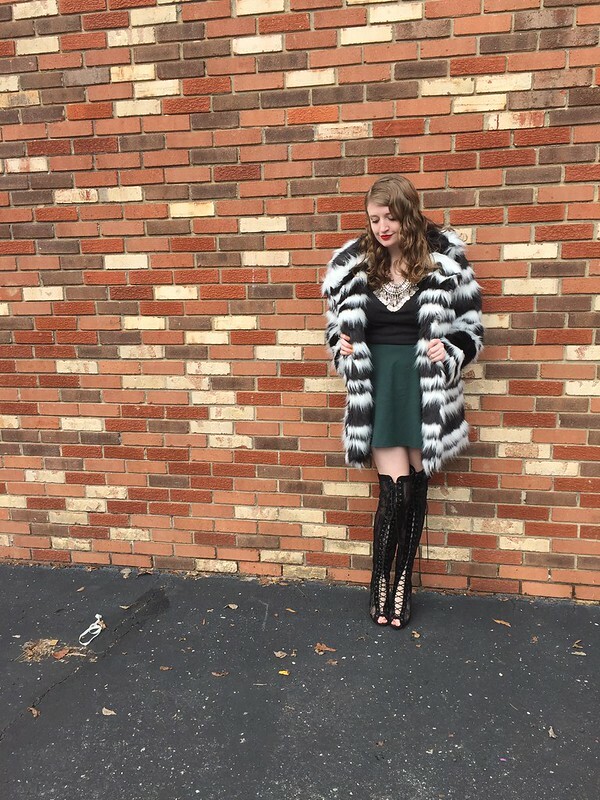 However, for this look, I chose to add little more glamour with a silver statement necklace, bold red lipstick and lace-up, thigh-high boots. I can't wait to see all of the different ways that I'll be able to style this coat; stayed tuned for more in the upcoming weeks! the coat looks luxurious and gorgeous, so beautiful!